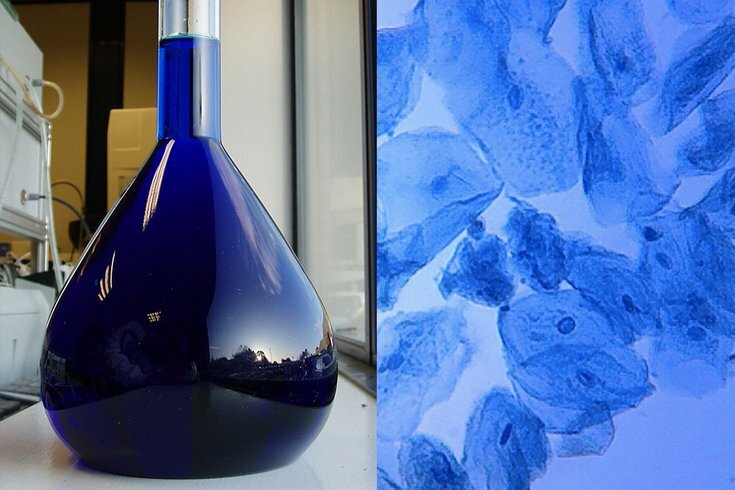 A flask of a methylene blue solution, left, and human cheek cells stained with the chemical, right. Research at the University of Maryland suggests that a common, inexpensive and safe chemical could slow the aging of human skin. The antioxidant, methylene blue, might be able to slow or reverse several well-established signs of aging when tested in cultured human skin cells and simulated skin tissue, according to evidence published online Tuesday in the journal Scientific Reports. "Our work suggests that methylene blue could be a powerful antioxidant for use in skin care products," Kan Cao, senior author on the study and an associate professor of cell biology and molecular genetics at UMD, said in a statement. "The effects we are seeing are not temporary. Methylene blue appears to make fundamental, long-term changes to skin cells." The researchers tested methylene blue for four weeks in skin cells from healthy middle-aged donors, as well as those diagnosed with progeria – a rare genetic disease that mimics the normal aging process at an accelerated rate. These cross-section images show three-dimensional human skin models made of living skin cells. Untreated model skin (left panel) shows a thinner dermis layer (black arrow) compared with model skin treated with the antioxidant methylene blue (right panel). A new study suggests that methylene blue could slow or reverse dermal thinning (a sign of aging) and a number of other symptoms of aging in human skin. In addition to methylene blue, the researchers tested three other known antioxidants and found methylene blue outperformed them, improving several age-related symptoms in cells from both healthy donors and progeria patients. The skin cells (fibroblasts, the cells that produce the structural protein collagen) experienced a decrease in damaging molecules known as reactive oxygen species, a reduced rate of cell death and an increase in the rate of cell division throughout the four-week treatment. Next, Cao and her colleagues tested methylene blue in fibroblasts from donors who were 80 years old and older) again for a period of four weeks. At the end of the treatment, their donor cells had experienced a range of improvements, including a decrease in two genes commonly used as indicators of cellular aging. The researchers then used simulated human skin to perform more experiments. This simulated skin – a three-dimensional model made of living skin cells – includes all the major layers and structures of skin tissue, with the exception of hair follicles and sweat glands. The model skin could also be used in skin irritation tests required by the Food and Drug Administration for the approval of new cosmetic products, Cao said.